Orbis, as a SEBI registered Custodian, offers you Custody and related services from India on a Zero-Conflict platform. We have complete connectivity with the financial markets thereby protecting your investment interests ensuring settlement of financial transactions at the contracted price on the contracted terms within the contracted period in line with accepted practices. Orbis is an established and appreciated provider of Clearing, Settlement and Custody services in India. Orbis has customized its offering for handling the unique needs of a PMS provider! We are offering a one stop solution comprising Custody, Clearing, Fund Accounting and Derivatives Clearing Services to the Portfolio Managers and their Ultimate Beneficiary Clients. We mitigate host of operational & business challenges, driven by complicated regulation, cost & time pressures coupled with increased service level demands that the portfolio managers are constantly facing. Orbis becomes your critical partner in business by consistently delivering exceptional back-office services and, in particular, developing customized reports as per their requirements which ensures great transparency and reporting. Orbis has a host of high quality services and can provide cost-effective solutions that create value, enhance effective management and allow fund managers to make informed decisions. We encourage the fund managers to focus on creating value through stock picking, asset allocation and fund selection, relying on Orbis’s to provide middle office and back-office services designed specifically for alternate investment funds. Orbis specialises in Custody, Clearing & Settlement Services. With our comprehensive understanding of regulations, risk and technology platforms, we create and offer innovative securities services solutions. With our combined understanding of regulation, risk and technology platforms, we create innovative securities services and solutions. We have developed necessary capabilities in Custody and Fund Accounting for handling Pool level as well as Scheme level transactions. Orbis has a host of high quality services and can provide cost-effective solutions creating value, enhancing effective management and in the process allowing the fund managers to make informed & timely decisions. To assist fund managers to manage their complex multi-asset portfolios, we have designed an extensive portfolio of value added services which includes well designed and crafted reporting tools including Unrealised Gains, Realised Gains, NAV, Fee calculations, Valuation reporting and investor reporting. Mutual Funds can utilise the full range of tools to manage complex portfolios and to report underlying stakeholders, investors and regulators.. Given its very nature, a Family Office may have multiple entities within its umbrella and each would also be segregated account like a PMS account! Orbis has a customized offering that addresses these unique needs of any family office. We are offering a one stop solution comprising Custody, Clearing, Fund Accounting and Derivatives Clearing Services to these Offices and their Beneficiary members. Orbis specialises in services for Broker Dealers. By taking over the Broker’s client account keeping including their Cash & Securities positions, Clearing, Settlement, Custody with extensive reporting we free the Brokers Office to focus on their core competencies. With our comprehensive understanding of regulations, risk and technology, we customise innovative securities services solutions. Orbis provides flexible solutions for Private Bankers and Wealth Managers offering comprehensive tailor-made solutions linked to their needs. Private Bankers and Wealth Managers, many a time, may have varying risk appetites with some unique needs with respect to their investments. Orbis renders Integrated activities which includes Custody, Clearing & Settlement and Fund Accounting services for most complex and diverse portfolios with comprehensive integrated reporting. The Systems and processes at Orbis supports all the permissible instruments including Listed & Unlisted Equity, Mutual Funds, Corporate Debt and Government Securities. By partnering with us, you widen your range of possibilities, improving your ability to invest in multiple asset classes. Orbis with its client focussed approach, offers specialised services to NBFC’s that may also be lending against the security of liquid financial securities such as listed equity shares, corporate bonds and government securities. In effect, Orbis complements the NBFC’s lending operations by addressing counter party risk and settling trades directly with Exchanges. Orbis becomes your critical partner in business by consistently delivering exceptional back-office services and, in particular, developing customized reports as per your requirements which ensures transparency and reporting. These Integrated services from Orbis include Custody, Clearing & Settlement and NBFC Oriented Fund Accounting services for most complex and diverse portfolios with comprehensive integrated reporting. 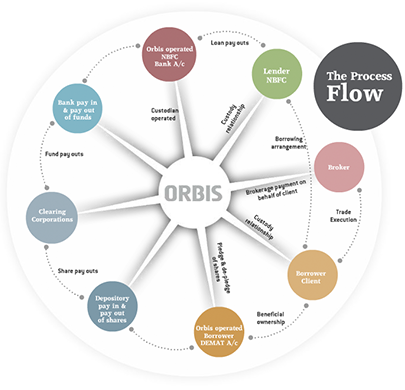 The Systems and processes at Orbis supports all the permissible instruments including Listed & Unlisted Equity, Mutual Funds, Corporate Debt and Government Securities.